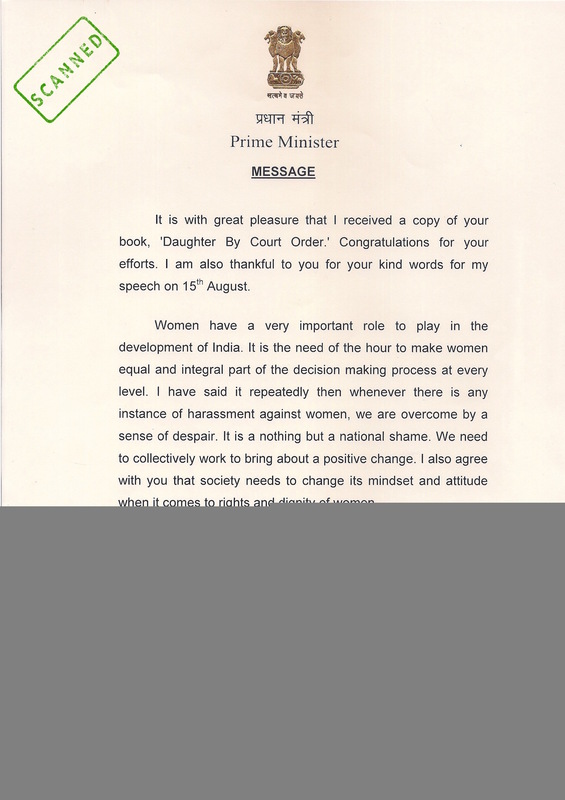 It is with great pleasure that I received a copy of your book, ‘Daughter By Court Order.’ Congratulations for your efforts. I am also thankful to you for your kind words for my speech on 15th August. 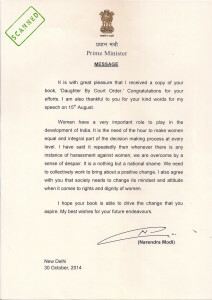 Women have a very important role to play in the development of India. It is the need of the hour to make women equal and integral part of the decision making process at every level. I have said it repeatedly then whenever there is any instance of harassment against women, we are overcome by a sense of despair. It is nothing but a national shame. We need to collectively work to bring about a positive change. I also agree with you that society needs to change its mindset and attitude when it comes to rights and dignity of women. I hope your book is able to drive the change that you aspire. My best wishes for your future endeavours.